Over the past decade, recurve bows have really increased in popularity and many people attribute that to The Hunger Games film and book franchise. Katniss Everdeen, the main protagonist, uses a recurve bow, and everyone wanted to be like the Mockingjay. If you are familiar with takedown recurve bows, then assembling one shouldn’t be much of an issue for you. Typically, regardless of the brand, they are put together the same way. However, if you find yourself requiring more assistance, there are plenty of video tutorials that can be found online that provide great pointers and step-by-step instructions. In this article, we’ve taken a look at the Mandarin Duck Phantom Recurve Bow so we can break down what makes this a viable option for archers everywhere. You can use this review to help you uncover whether or not this particular bow is suitable enough to meet your specific needs. The Mandarin Duck Phantom Takedown Recurve Bow is a product that is designed to be used during target-shooting practices and archery sports. Mandarin Duck is a very well-known brand name, and the recurve bow in question, as of the moment, has earned excellent customer feedback. The primary concern of the bow is to provide the archer with a solid bow that works beneath a variety of draw weights to produce the speed and results that you are looking for. One of the most exceptional features that drew us to the Mandarin Duck Phantom is its comfortable take-down design. It makes it extremely convenient to disassemble so that you can carry it for outdoor archery adventures and store it without taking up too much space. Also, once you get the hang of assembling it, putting it back together is just as simple. Aside from the standard owner’s manual and packaging, Mandarin Duck provides some of the things that are needed to assemble the bow such as two laminated wood and fiberglass limbs, a string, a simple arrow rest, and a spanner. 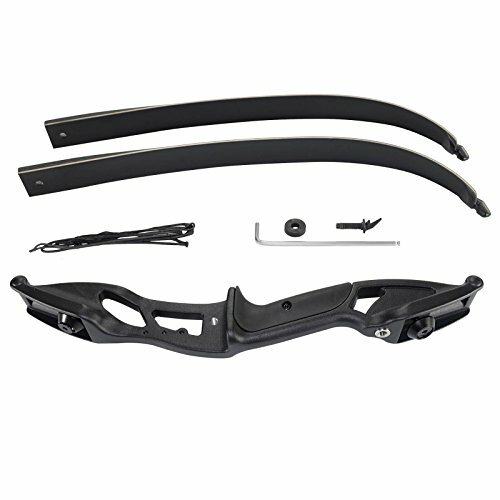 It also comes with a riser that is made of an aluminum alloy and has been covered with quality rubber materials. However, the package doesn’t include arrows or a stringer, which is also recommended during assembly. The bow itself has a length of 56 inches, a draw length of 29 inches, and a draw weight that ranges from 30 to 50 pounds. As a guide, the higher the draw weight, the more power that is behind the launch of the arrow. Thus, if you use this recurve bow for hunting, it’s usually suggested that you go with a draw weight that is over 35 pounds for a mid-range game, and between 40 and 50 pounds for large game such as deer. There aren’t many downfalls that we were able to come across when testing out the Mandarin Duck Phantom, except for it being right-handed only, and how loud it is. There are few reasons why you might need to diminish the sound of the bow, but the majority of them have to do with hunting. Definitely, you would find it difficult to hunt with a bow that has a proper draw weight if the sound of the piece is scaring off the animal. To help resolve the issue for you, we’ve included a helpful video tutorial that teaches you how you can silence the Mandarin Duck Phantom. The video also includes a clear example of how loud the bow is before the silencer is applied, and how loud it is afterward. Additionally, if you want to find out more about how the Mandarin Duck Phantom Recurve Bow performs, you can watch this video which breaks down the entire bow in detail and provides everything you need to know. If you are open to spending a little more on a recurve bow, investing in the Samick Sage Takedown Recurve Bow could be an excellent choice for you. Unlike the Mandarin Duck Phantom, this bow comes in two types, which are, left-hand and right-hand orientations. Likewise, the draw weight reaches up to an impressive 60 pounds, which makes it a good option for experienced archers who love to hunt or join archery tournaments. This bow has a recommended draw length of up to 29 inches, and the limbs are made of hard maple wood in combination with black fiberglass. 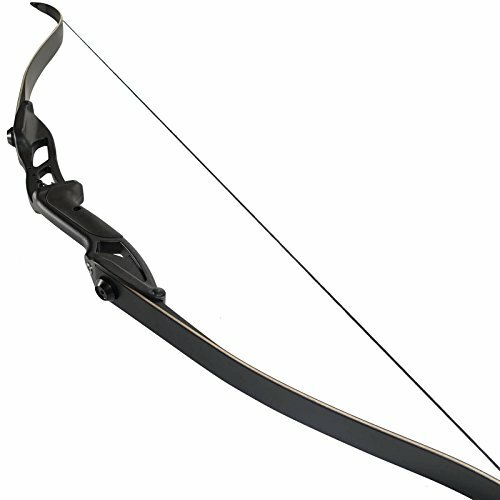 Additionally, the Samick Sage Takedown Recurve Bow is one of the top-selling recurve bows online. Both of these bows, however, are very highly reviewed and do not come with a stringer and arrows. Under most circumstances, experienced archers would recommend bows with a draw weight of under 25 pounds for beginners. The Mandarin Duck Phantom has a draw weight that ranges from 30 to 50 pounds, gearing the recurve bow towards archers who have enough understanding of how recurve bows work to manage one with higher draw weights. Also, this specific bow is right hand orientated only, so if you are a lefty, you should look into another option. Now that we’ve taken the time to go over the Mandarin Duck Phantom, and learned how to silence it, we do think that it’s a good idea to put the bow on your short list. It definitely makes the cut. It’s designed to last and can be used for hunting, archery tournaments, and shooting practices. While it’s not the least expensive bow you can find, it lands in the mid-range market and is priced more than reasonable for the quality product that you get. It also has excellent customer reviews and a lot of resources available to those of you who are searching for more information on how to use the Mandarin Duck Phantom. If you're not interested in any of the bows we reviewed here, why don't check out our detailed list of the 5 best selling recurve bows available!